That’s Nesea: a team created by three friends, united by love for Capri’s culture and history and pride of living in a wonderful place. We organize guided tours in Capri and Anacapri for showing you the most beautiful places on the island. Live an experience that is one of a kind. 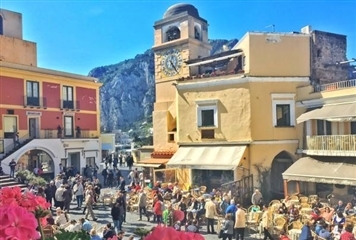 A full day itinerary for those who want to know the two souls of the island: Capri and Anacapri. An interesting solution for those who visit the island for just one day. Exclusive tour of the island of Capri on board a typical caprese “gozzo”, accompanied by an experienced island sailor who will show you the magnificent caves and inlets of the island. Your holiday in Capri is special, as we well know. Time is precious and you have a desire, an itinerary to discover calmly with a guided tour. We can arrange customized tours, we define the paths and trails based on your preferences.